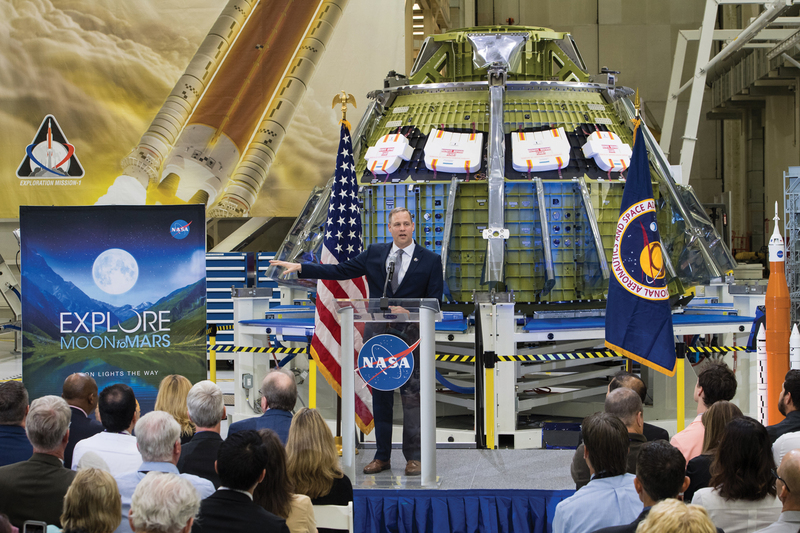 That was NASA Administrator Jim Bridenstine addressing NASA employees and the media on the space agency’s plans to send astronauts to the moon and eventually to Mars in the next few years. NASA invited media and social media to agency centers across the country Monday, March 11, following the delivery of President Trump’s fiscal year 2020 budget proposal to the U.S. Congress. 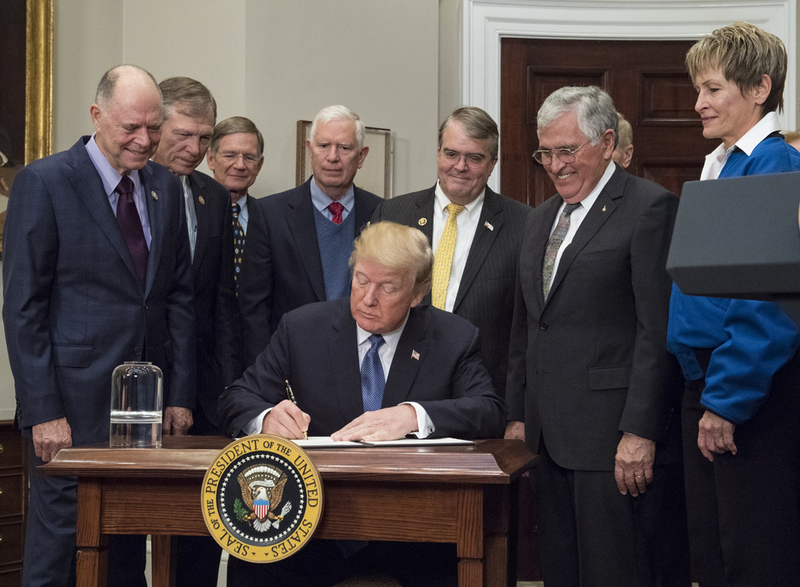 “Beginning with a series of small commercial delivery missions to the moon as early as this year, we will use new landers, robots and eventually humans by 2028 to conduct science across the entire lunar surface,” Bridenstine said as he discussed the Gateway project, following a welcome by JSC Director Mark Geyer. “We will go to the Moon in the next decade with innovative, new technologies and systems to explore more locations across the lunar surface than ever before. This time, when we go to the Moon, we will stay. We will use what we learn as we move forward to the Moon to take the next giant leap – sending astronauts to Mars. The Space Launch System, Orion spacecraft, and Gateway will continue to be our backbone for deep space exploration, he said. “With this budget, NASA’s critical work studying our home planet and the Sun will benefit humankind for generations. We will reveal the unknown with missions to Jupiter’s moon Europa and the launch of the James Webb Space Telescope. We will continue planning and developing the first round-trip mission to the Red Planet with Mars Sample Return. Afterwards, JSC employees showed reporters all the hard work they have been putting in to accomplish the Moon2Mars goal. “The Johnson Space Center is a national treasure, and all the men and women who work here are a national asset,” Vice President Mike Pence said as he addressed the standing room only crowd in JSC’s Teague Auditorium. 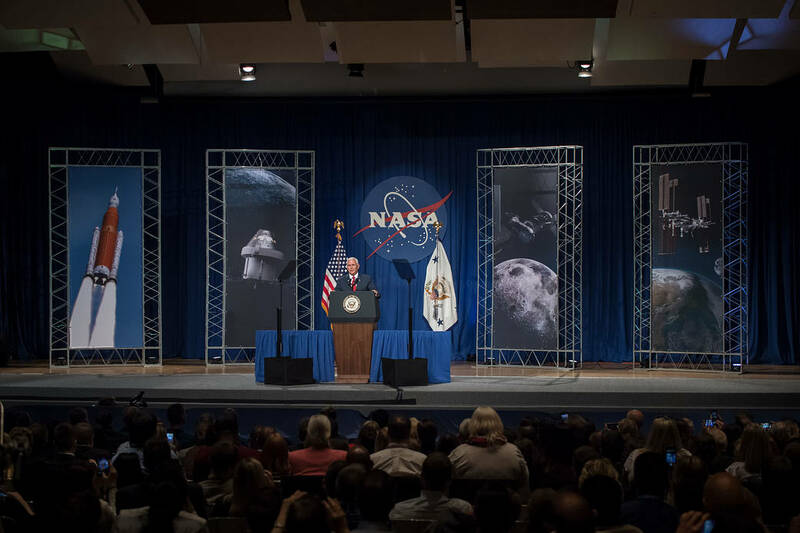 “America will lead mankind to the stars once again,” Vice President Mike Pence told a standing room only crowd in Johnson Space Center’s Teague Auditorium, “and,” he continued, “there are plans to send man back to the moon for the first time in nearly 50 years. Welcome words for a group of hard-working engineers and space scientists, after a decade of nearly being ignored by government officials. “The vice president was at JSC after a stop in the hard-hit city of Rockport, where Hurricane Harvey made landfall Aug. 25, 2017 and where he and Gov. Greg Abbott made a helicopter tour to survey the recovery. 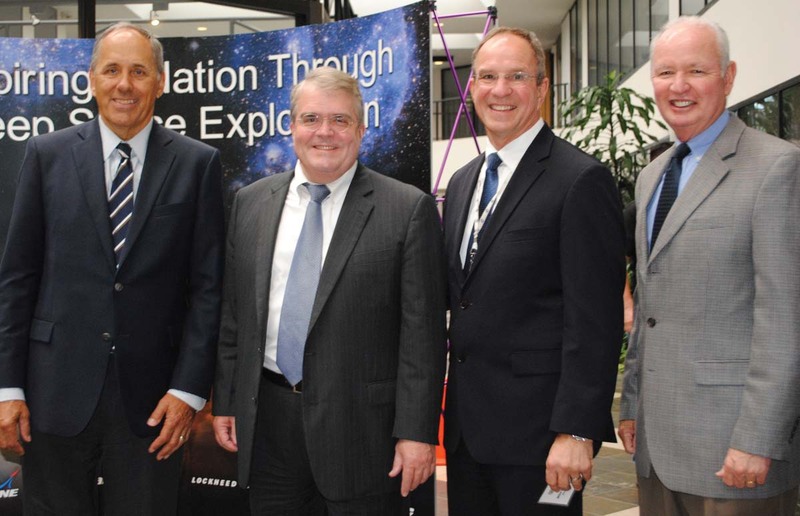 Then it was on to Houston for several events before ending his Texas journey at the place he said “has been at the forefront of America’s journey to the stars,” bringing smiles to the faces of JSC Director Mark Geyer and Deputy Director Vanessa Wyche and the hundreds of other employees looking on. It was his second visit to NASA’s lead space center. Earlier, he was here to introduce NASA’s newest astronauts. 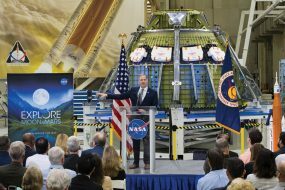 NASA Administrator Jim Bridenstine, who introduced Pence, also was back for his second visit in three weeks, much to the delight of the audience, most of whom couldn’t recall this much attention from Washington in years. Pence, who serves as chairman of the National Space Council, admitted to being a space geek. In fact, he said he was like a kid in a candy store while touring JSC with Apollo 17 astronaut Jack Schmitt, one of the last two men to walk on the moon. 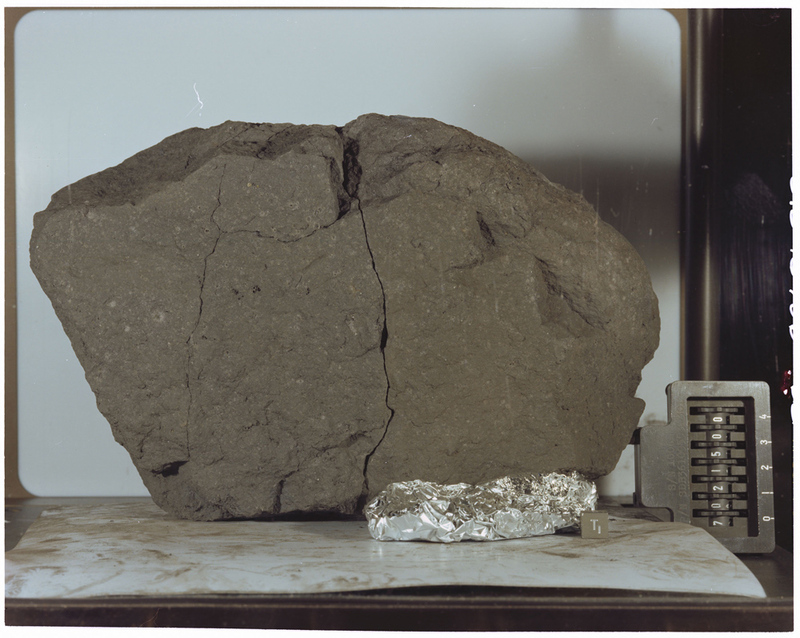 Together, they visited NASA’s big swimming pool – also known as the Neutral Buoyancy Lab – and JSC’s eye-popping collection of moon rocks. Schmitt flew on the nation&#39;s last mission to the moon 46 years ago in 1972. For more than 50 years, this storied center has been at the forefront of America&#39;s journey to the stars,” Pence continued. This is the ‘home of the Astronaut Corps.’ And, here, from the Mission Control Center, you have guided every American-crewed space expedition since 1965. The names and the voyages that you directed from this place adorn the mantle of American greatness. In Project Gemini, you steered some of our earliest astronauts high above what they called the “Blue Marble”, into low Earth orbit. “In the Apollo Program, you navigated the first members of the human family to the moon and back. “At this very hour, you walk with our astronauts through their duties as they walk 200 miles above us, orbiting the Earth every 90 minutes, on the International Space Station. Congressman John Culberson, second from left, stops for a photo with, from left, Jacobs Vice President Lon Miller, Oceaneering Vice President Mike Bloomfield and Orbital ATK Vice President Brian Duffy, as he prepares to return to Washington. In case you have been wondering when we will ever get to Mars, and even back to the moon again, you are not alone. Congressman John Culberson has been, too. He came down to Clear Lake for a visit with a group of aerospace executives over at Oceaneering’s headquarters on Space Center Boulevard and was quick to let everyone know that all of Washington had their backs. 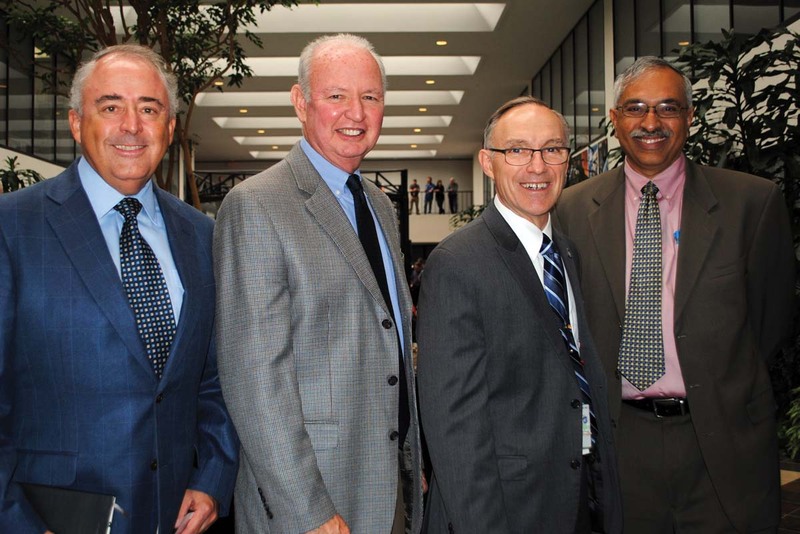 Early arrivals for the meeting at Oceaneering Space Systems included, from left, UTC Aerospace Systems Business Development Director William Bastedo, Orbital ATK Vice President Brian Duffy, Oceaneering Business Development Director Dr. Carl Walz and Bastion Technologies Chief Operating Officer Dr. Jayant Ramakrishnan. “Don’t worry about funding,” Culberson said. “The president, vice president and Congress are all behind you. Forget what you see on TV. We all love the space program,” he told the roomful of representatives from various aerospace firms. Then he looked around the table at Boeing ISS Program Manager Mark Mulqueen, Lockheed Martin Orion Deputy Program Manager Larry Price, Orbital Vice President Brian Duffy and Oceaneering Space Systems Vice President and General Manager Mike Bloomfield, and after expressing his love for the space program, wanted to know what was the holdup. When are we going to go to the moon and on the Mars? Afterwards, the popular congressman spoke to the aerospace executives, who were joined by all the Oceaneering employees, giving them an update on the NASA budget. Boeing also was in the spotlight in recent days, inviting aerospace friends to its new groundbreaking Above and Beyond exhibit at Space Center Houston that explores the wonder of flight and the marvels of aerospace innovation, design and technology. There is only one word to describe it: breath taking. One eye catching feature was the Space Elevator simulation, which takes one to the edge of the universe. 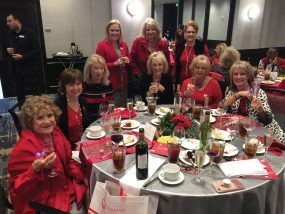 One person attending said he had been going to Space Center Houston regularly for almost 15 years. By far, this was the most interesting, best “hands on” interactive experience ever hosted at Space Center Houston! Above and Beyond opens as Boeing enters its second century of aerospace achievement and will make its worldwide debut at the Smithsonian’s Air and Space Museum Aug. 1. Afterwards, there are stops in Dubai, St. Louis, Charleston, S.C., Riyadh, Seattle, London, Tokyo and Chicago. As the Space Center Houston exhibit was opening, Lockheed Martin was busy over at the Johnson Space Center planning to test a special model of the Orion that it expects to carry astronauts to Mars. If all goes as planned during the test at Kennedy Space Center in April 2019, the Orion will separate from a booster rocket at 31,000 feet in half a second. If it’s a success, it will mean the eventual crew of astronauts can escape if the rocket should explode. It also will mean a trip to the moon in 2023 and a journey to Mars in 2030 is likely. An uncrewed flight of the Orion is planned for December 2019. However, because of construction delays with the Space Launch System rocket, that could change.